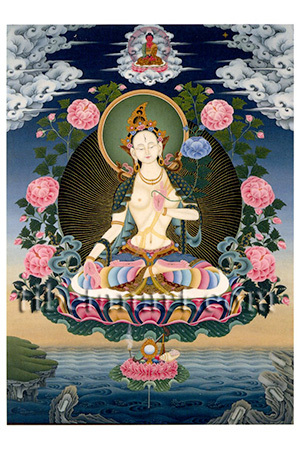 Tara, the 'Liberator or Saviouress', is the female bodhisattva of compassion and the patron goddess of Tibet. In her two principal green and white aspects she is believed to have manifested from the tears of Avalokiteshvara, the male bodhisattva of great compassion. In her white pacifying aspect as 'seven-eyed' (saptalocana) Tara, she is commonly invoked for increasing longevity or removing life-threatening obstacles. Along with Amitayus and Usnishavijaya she appears as part of the trinity of long-life deities. White Tara is extremely beautiful and youthful, adorned with all manner of divine silk and jewel ornaments, and she sits in vajra-posture upon a white moon disc and a multicoloured lotus. The three eyes of her face symbolize the purities of her body, speech and mind; and the four eyes in her palms and soles represent the 'four immeasurables' of her boundless compassion, loving kindness, sympathetic joy and perfect equanimity. With her lowered right hand she makes the boon-granting gesture, and with her left hand held before her heart in the gesture of giving refuge, she holds the stem of an immaculate lotus flower. Within the pink lotus that appears beneath Tara's throne is an offering of the five senses, and above her halo is red Amitabha Buddha.